It’s the most wonderful time of the year! And not because of any holiday (though there are plenty of those to enjoy), but because now is a great time of year to buy a home! Traditionally when people think of the best time of year to buy a home they tend to think of the spring, but let’s face it, your personal home buying schedule doesn’t always correspond with the housing market, and there are plenty of advantages to buying a home in the off season. T he off season is an especially good time to buy new construction as many builders are running builder incentive programs in order to get more homes sold by the end of the year. 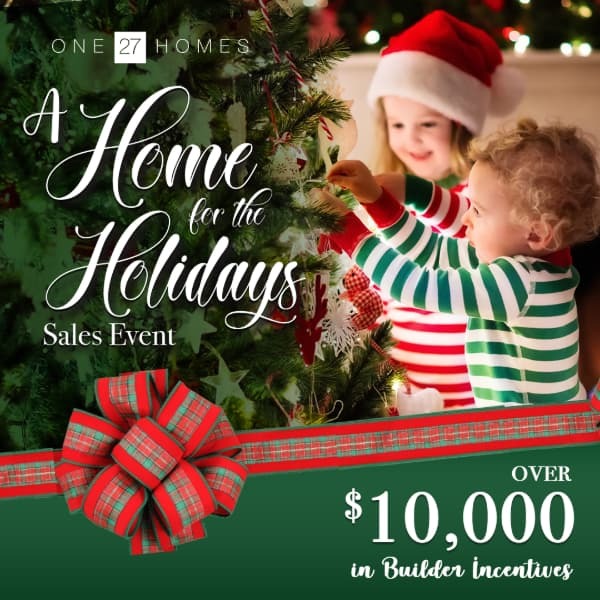 For example, one of our builders, One27Homes, is running a Home for the Holidays sales event. 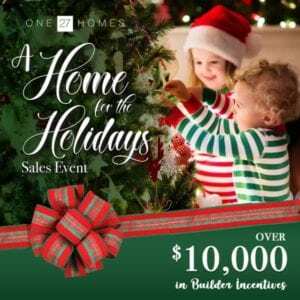 With this particular promo you can earn up to $10,000 in builder incentives to go towards a new home! When you take advantage of incentives such as these, you can take the money that you would be putting towards closing costs and upgrades and put them towards something else you might want. Think of it as an additional holiday present! One of the great things about searching for homes in the off season is that fewer people are actively looking for homes. Which means you won’t have to worry as much about the pressure from other homebuyers looking at the same home as you. This gives you a little more time to think about which home you want to put an offer on, rather than rushing into a choice you’re not 100% sure about. It is true that inventory tends to decrease during the off season; however, that doesn’t mean there isn’t still an incredible selection of homes on the market. The reality of the situation is that, as when you buy a home often corresponds with when is the most convenient time to buy a new home for you, rather than the housing market. This is also true of sellers. Home owners list their home whenever is most convenient for them. Of course no matter what time of year you decide to buy a home, when you work with JaclynSmithProperties you’re working with a team that will give you close personal attention, and help you find the perfect home of your dreams. Interested in finding the home of your dreams in Clayton, North Carolina or the surrounding area? Feel free to give us a call!